Shop Barbie toys online. 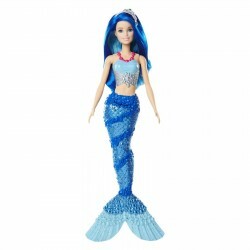 Buy Barbie toys at great prices from Mighty Utan in Malaysia! 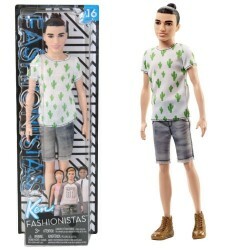 Item: FJF74 Age: 3+ YearsEach Ken™ Fashionistas™ doll has his own look and style – from sporty to casual to preppy, all of the fashion are inspired by the latest trends! 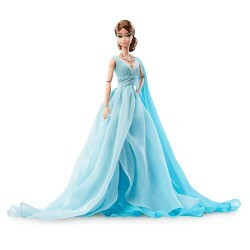 Item:DYX74 Ages: 3+ YearsGracefully draped in luxurious blue chiffon, Barbie® doll is the epitome of elegance. 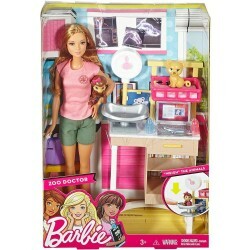 Item: DVG11 Ages: 3+ YearsExplore the world of medicine with Barbie® dolls and medical playsets! Barbie® zoo doctor doll is ready to see pet patients with furniture for a stylish office, accessories to play out an exam and TWO adorable baby animals to care for. 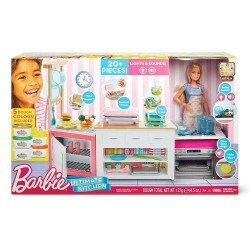 Item: FRH73 Ages: 4+ yearsBarbie® doll inspires young chefs to cook up imaginative stories and meals! 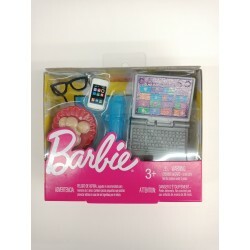 Item: FJB22 Ages: 3 Years+Two Barbie® dolls can accomplish big dreams working together as colleagues! Barbie® career-themed sets let young imaginations explore various partner careers. Item: FWV15 Ages:3+ YearsBarbie® doll and her friends, like Ken™ doll, take young explorers around the world with travel-themed sets. Item:FWV17 Ages: 3+ YearsBarbie doll and her family, like Skipper doll, take young explorers around the world with travel-themed sets. 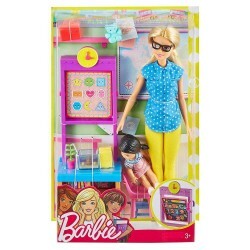 Item: DVG15 Ages: 3+ YearsCoach your students to the win with Barbie® dolls and sport-themed playsets! Barbie® tennis instructor set includes Barbie® doll as a tennis coach, a student doll and sports accessories that let young athletes practice and play! 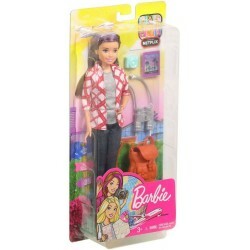 Item: FJB29 Age: 3+ YearsBarbie® career dolls and playsets inspire kids to dream big and aim high! Item: FKT03 Ages: 3+ YearsBarbie® doll (sold separately) loves to put her own twist on the latest fashion trends. 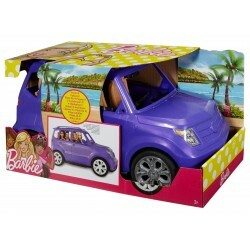 Item: DVX58 Ages: 3+ YearsHit the open road or go off road with the Barbie® SUV; the storytelling possibilities are endless! 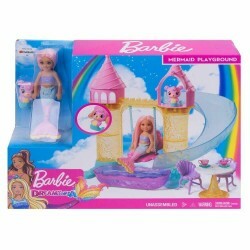 Item: FXT20 Ages:3+ YearsDive into playtime with Chelsea™ mermaid doll and her friend Merbear -- they have a sand castle playset loaded with fun! Item:FHY68 Ages: 3+ YearsEven the little things in life bring joy! With great accessories, girls can now express their personal style and give the Barbie super-style house by Mattel an individual touch. The office set guarantees a realistic gaming experience with endless creative possibilities. Theme: Home & Office & Technology & Laptop. Item: FHY66 Ages: 3+ YearsEven the little things in life bring joy! With great accessories, girls can now express their personal style and give the Barbie super-style house by Mattel an individual touch. The Taco party set guarantees a realistic gaming experience with endless creative possibilities. Theme: Living & Kitchen & Party & Food and Drink. 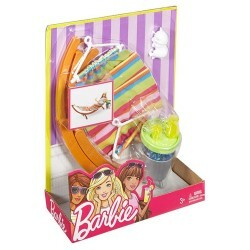 Item: FHY70 Ages: 3+ YearsThis set of Barbie accessories provides endless fun with the Barbie doll (doll sold separately). 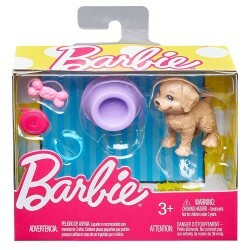 Item: FHY71 Ages: 3+ YearsThis set of Barbie accessories provides endless fun with the Barbie doll (doll sold separately). 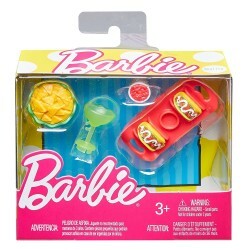 Item: FHY69 Ages: 3+ YearsThis set of Barbie accessories provides endless fun with the Barbie doll (doll sold separately). Item: FJB01 Ages: 3+ YearsBarbie® Skipper™ Babysitters Inc.™ dolls and playsets let kids be the babysitter with a Skipper™ or friend doll, a baby or toddler doll, furniture and accessories matched to classic childhood moments. The potty training-themed set has so many fun, working features to add inspiration to storytelling.